The tenth and rowdiest chief of the Wolfriders, Bearclaw took risks, gambled with trolls, provoked humans for amusement, and occupied the Now of Wolf Thought with singular aplomb. Though fiercely protective of his tribe, his thirst for dreamberry wine became a violent habit—and his thirst for revenge led to a self-perpetuating conflict with humans that left his tribe’s ranks dangerously thin. Earlier in life, Bearclaw discovered the trolls after patiently staking out Old Maggoty‘s carefully-concealed dreamberry harvesting operation. He recognized his long-time lovemate, Joyleaf, after many centuries of life. The couple raised Cutter, who achieved elfin adulthood only to see his father die after battling the monster Madcoil. Bearclaw’s body, as much a part of the World of Two Moons as any Wolfriders, was claimed by his own wolf Blackfell. His spirit now roams the World of Two moons, occasionally manifesting itself to Cutter in times of great duress. 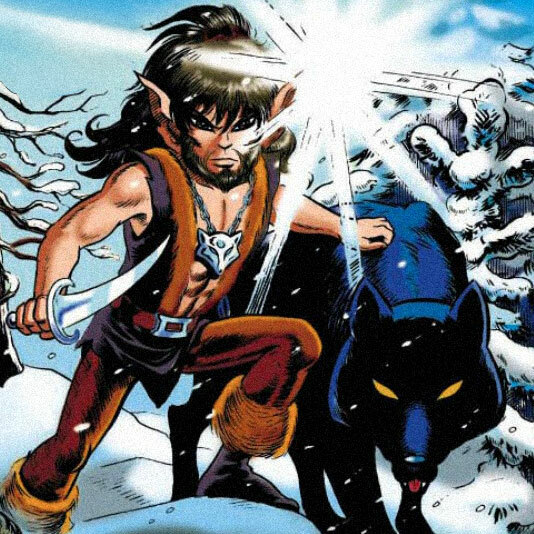 Bearclaw had brown hair, brown eyes, and a goatee. He wore fur-trimmed brown leathers, and was rarely seen without two artifacts won from the Trolls in games of chance: a striking wolf’s head pendant, and New Moon, a sword crafted by Two-Edge to inspire the quest that would ultimately be undertaken by its inheritor.